Ollie, meet the Internet. Internet, meet Ollie. Skill Level: Beginner. Requires basic crochet skills. Small amounts of worsted weight yarn. These little guys don't use a lot of yardage. If you want to felt your Ollie, make sure you use 100% wool. You'll need three colors of yarn for the body, eyes and beak. Magic Ring – if you're not familiar with the 'magic ring' there are a lot of great tutorials online. Here is one of my favorites. Gauge is not important in this pattern; however, you should make sure your stitches are tight enough that the stuffing will not show through your finished product. This pattern is crocheted in the round. At the beginning of each round, place your stitch marker in the last stitch. Move your stitch marker up with each new round. Leave a long tail (6-8 inches) for attaching to body. Stop here to sew on the face. Place your eyes where you want them and attach the safety eyes through the center of the eyes. * You want the edges of the eyes to just be touching each other. Use the safety eyes to keep the eye pieces on the head and sew around the edges of the eyes to attach them to the head. CH3, SL ST in first chain. Sew these chains to the center of the eyes. Step 1: Make a 'V' between the two eyes. Weave in all ends from attaching wings, eyes and beak. If you do not plan on felting your owl, Congratulations! You’re done! 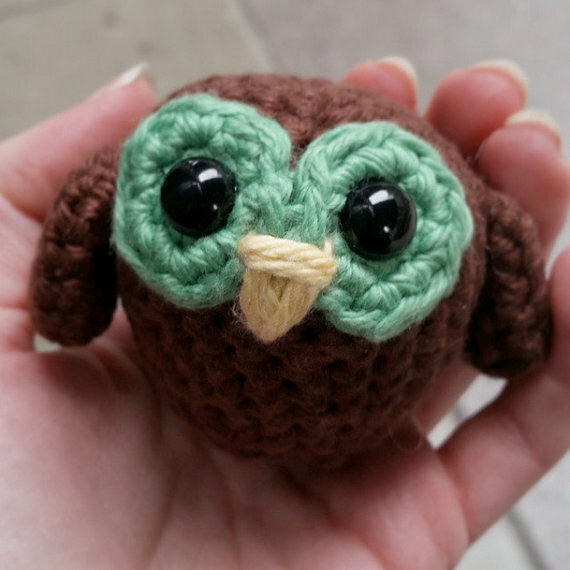 I hope you love your little owl! If you made one - I'd love to see your pictures. Link your project page on Ravelry, or tag @samsqueak in your instagram pics! Felting is the process of binding the wool or other natural fibers of your yarn. 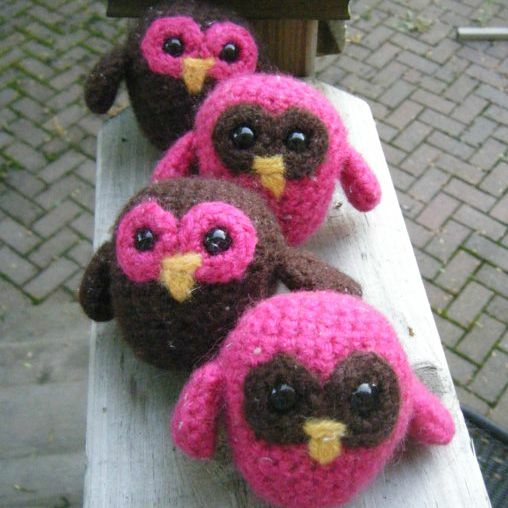 During the felting your owl will shrink in size and the stitches will become less visible as the fibers bind together. Set your washer to hot wash and cold rinse and use the maximum agitation and length of cycle. Put your owl in a lingerie bag or a zipped pillow case. Throw in some sturdy clothing or towels to give it something to agitate against. Add a few tablespoons of detergent. Allow the washer to run a full cycle of agitation. Before the spin cycle, take out your bag and check the progress of the felting. If your creation is felted to your satisfaction, put it back in the wash for the rinse cycle. If you would like it to be felted further, put it back for another agitation cycle. After the rinse cycle, if you want it to felt just a bit more you can throw your creation in the dryer on low with a dry towel for a few minutes. Check on your creation frequently and pull it out when it’s still a little damp. Fluff your little owl back into shape and let it dry fully on a towel.